Summary: A vital resource for anyone planning an inquiry-based leadership program, this NWP monograph details the strategies and practices that define the Philadelphia Writing Project’s Leadership Inquiry Seminar, a yearlong institute designed to support the professional growth and reflective practice of urban educators as they examine their own pathways to leadership. The Leadership Inquiry Seminar (LIS) was developed as a response to the uncertainty of what teaching and learning might look like in the midst of challenges that teachers were facing during a turbulent era of school reform in the School District of Philadelphia. 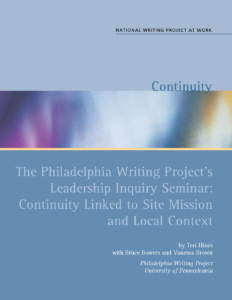 Through the site’s commitment to inquiry and with a goal of being proactive in nurturing leadership, LIS, one of the Philadelphia Writing Project’s most valued continuity programs, continues to provide a space for teacher-consultants to share an inquiry into the topic of leadership, while empowering their sense of personal agency. Uncertainties at other writing project sites may be different, but change, whether in funding, in leadership, or in district policies, is likely to affect all NWP sites. This publication—which offers a comprehensive look at the LIS design, chronicles the hands-on development of materials by teacher-consultant facilitators, and includes a case study of the impact of LIS on one of the participants—will provide a model that can inform continuity programs at all NWP sites.